As previously promised, here is another update covering more gameplay related information. For this, we have our Senior Game Designer David Sallmann sitting down once more to explain to you how we approach weapons and shot types in the game to make weapons interesting, varied and most of all, fun! When we first started prototyping weapons, each designer would put his or her weapon concepts to paper, and one of our programmers would hard-code that weapon. This made for a slow and clunky process, as coding takes time, and when the designers wanted to test different things, this required changes to the code further slowing down the process. We could also only change certain values, but not fundamentally alter the way a specific weapon works. This wasn’t ideal for prototyping, which is about quickly (and messily) tinkering with different concepts and checking whether they pan out in practice, how they compare to alternate approaches and how they interact with other concepts. To remedy that, we overhauled the entire approach to creating weapons. Instead of coding each weapon individually, we designed and coded building blocks for the weapons that don’t do anything meaningful on their own, but can be quickly assembled and modified via scripting by the designers to create a staggering variety of weapons. Coding that system took a few days, but in the end, we saved a huge amount of time, resulting in dozens of weapons as opposed to a mere handful, and way crazier weapons to boot. 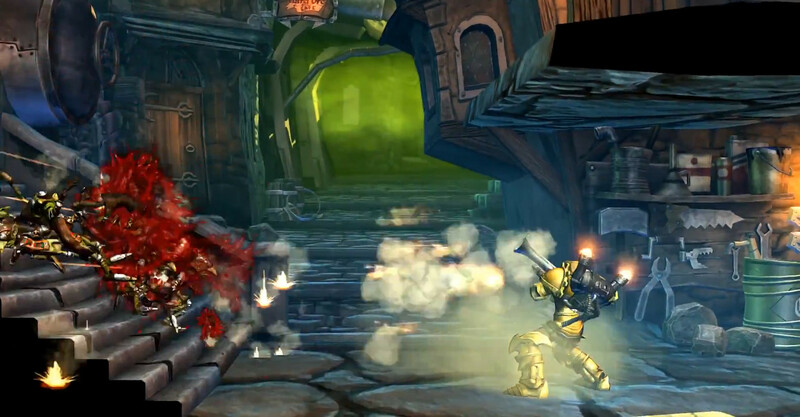 Pictured above, a Shotgun type weapon wreaking havoc in a group of goblins! Yeah! So, how do those building blocks work? To assemble weapons, we distinguish between projectile patterns and the projectiles themselves. A pattern can contain any number of projectiles. Whenever that pattern gets triggered, all the projectiles listed under that pattern are fired. We can set the rate of fire, the angle of each individual projectile, whether that pattern is triggered by pressing the fire button or by other conditions (e.g. on impact of a specific projectile), and more. The projectiles themselves are a bit more complex, listing properties such as speed, range, size, damage, force (for knockback, knockdown, launches etc. ), as well as special properties such as being affected by gravity or bouncing off level geometry. Pictured above, projectiles from a Designer perspective. Lots of numbers. They also have optional conditions and consequences, like “when you hit an enemy, despawn”. Those are key to building crazy weapons, because we can use those to trigger more patterns, which can contain projectiles that trigger other patterns, and we can branch and loop those as we wish. So instead of the boring (but necessary) “despawn this projectile on a hit”, we can also do things like “spawn pattern X on a hit” or “transform into pattern Y on a hit”. We can use a range of conditions for that, be it range, time, number of bounces, or what you hit. This allows for crazy chain reactions like a rocket that pierces enemies and triggers an explosion every time it hits, which spawns smaller rockets that rain fire on everything below. You can combine those elements in any way you wish, so if you want the aforementioned rockets to shoot shotgun shells instead, you can. If you want those shotgun shells to bounce and transform into cannon balls, you can. 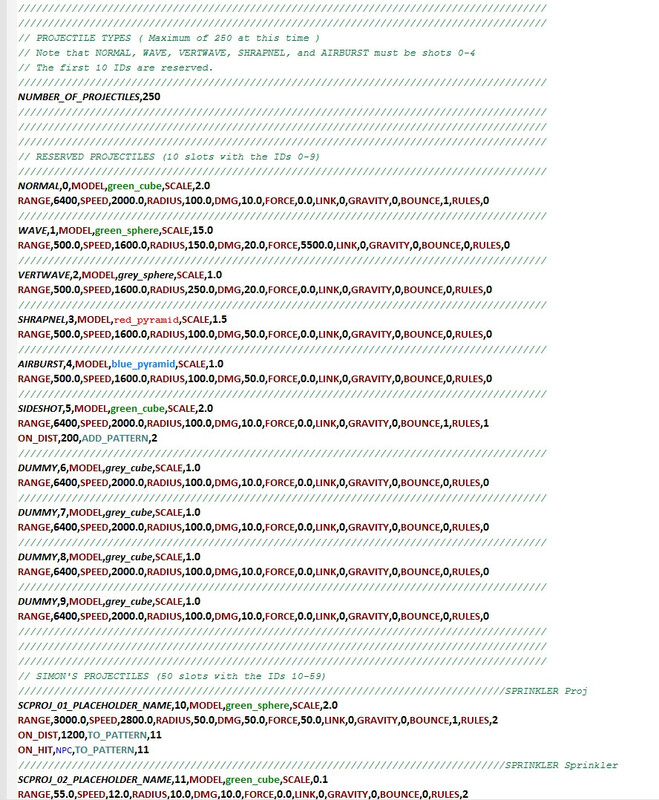 This was just a random example of course; not every concept is useful, meaningful or sound, and… hmm. Maybe I should prototype that. There will be an update about Ravensdale as a setting again soon. We are planning to give you a little more insight into the world. We are working on a little surprise in that regard! That's it for now friends! Enjoy your day, enjoy the update and all the best! This week we have a few things lined up, some of which that aren’t on the calendar, and one rather important announcement for many members of our community. There will also be a calendar update sometime this week. If the Kickstarter succeeds all you DRM haters out there can rejoice! Along with our PC and Linux versions, we will also release one that is DRM-free. There may be some difference in how the multiplayer works in the DRM-free version (such as how matchmaking works etc.) but those will be clarified later. Last week a lot of you really enjoyed the setting and gameplay updates we gave you, so we’ve planned for a few more this week. You’ll learn about some of the mechanics the designers are toying with, why they are toying with them and more about the story behind Ravensdale. Tuesday, August 6th: Team Spotlight #3. This time you get to meet the Kickstarter team and see what goes on in Kickstarter HQ. Monday, August 12th Live chat with the devs. Come hang out with us again from 12pm- 7pm CET at twitch.tv/blackforestgames. Thursday, August 15th: Unreal Tournament 99’ gaming session. We’ve invited some dev-friends of ours this time, and hope you’ll join too! There are a few details to be worked out but you can find all of the information in our facebook event , and we’ll also post an update here, and on twitter the day of. Yesterday we celebrated the half-way point of the campaign! We hosted a live show to hang out with you guys and Specki T.D of In Extremo and Mark Meer just happened to stop by. We answered some of your questions, as did our guests, covering everything from Ravensdale's future plans, to Specki's drummer idols and how Mark gets his hair so perfect. Watch it here. We also featured our first In Extremo video diary, with messages from some of the band mates while they prepare for the release of their new album Kunstraub. You can watch that, here. Next week we'll be releasing out next spotlight, which will take you into the kickstarter team headquarters, as well as updates containing information about plans for gameplay and the setting. For the latest progress on the game prototype, check out our dev blog, and to keep up with all our upcoming events, check out our campaign calendar. Today, we want to shed some more light on the gameplay systems that are being designed and worked on here at BFG for Ravensdale. We will start with the approach we are taking to level generation and design and to do that, our Senior Game Designer David Sallmann sat down to explain a bit about what we plan to do in this regard. Enjoy! For Ravensdale, we want to provide huge variety so that each game session offers new challenges. We want to support quick thinking, tactical flexibility and personal solutions over having the players learn the optimal way to resolve a specific part of a level and using it over and over again. In order to achieve that, we are layering the content of our levels. Each level chunk is like a template with “slots” for content like enemies, pickups, and environmental objects. The level designers determine what can spawn where in each chunk, and the game semi-randomly picks from that pool and assembles one of a huge number of possible combinations. In that example, the same level chunk can spawn (G)oblins, an (O)rc, a Goblin (M)ech, a (W)eapon, an (A)rmor piece or a (T)rap/hazard… Each chunk has its own rules about what can be spawned where. This illustration is simplified to convey the basic principle. The actual assembly rules are more complex. If we do our job right, there are no nonsensical combinations because we can control what category of content spawns in each slot, allowing us to set up configurations like “There is a reward at the far end, and at least one obstacle in the middle. That obstacle can be enemies or a hazard. 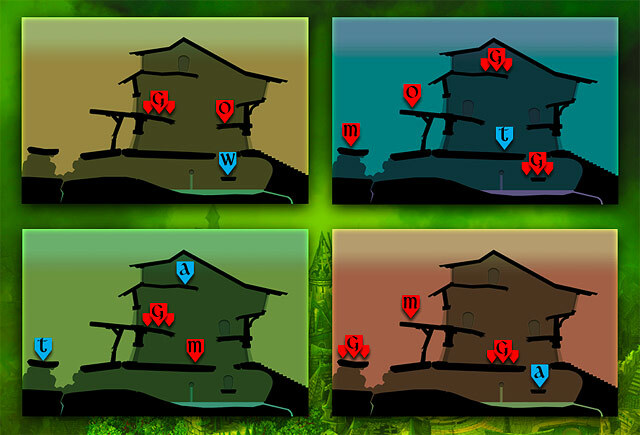 As an alternate configuration, a threat can spawn at the far end, but then the middle can spawn only a hazard.” The game would take care of the details, deciding what type of enemy, reward or hazard to spawn according to the difficulty of the area, other content in the level and a measure of chance. In the simplified examples above, how you play that particular chunk would shift radically depending on the spawned combination. In the first configuration, the hazard in the middle would be an obstacle that keeps you from your loot. In the second, the hazard is a potential tool for defeating the threat. Even the same configuration plays differently depending on the content spawned, your weapon and your armor. 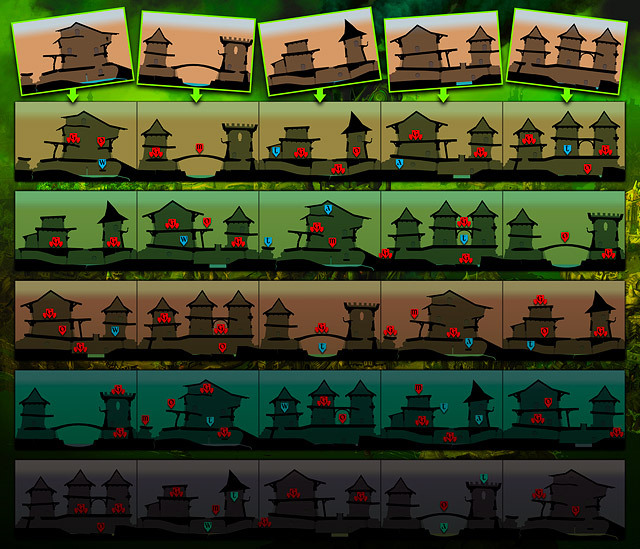 The levels themselves can be seen as a huge meta-template with slots for level chunks. Those too follow rules about what can spawn where (e.g. the difficulty level or complexity of a chunk). The following simplified example shows how such level chunks can be assembled in different sequences. Depicted is a purely linear template, but with underground and sky chunks (e.g. catacombs, the undercity, towers, airship fleets, etc.) we can create more complex, sprawling and nonlinear templates. The more chunks we provide, the more varied combinations will be possible, especially once we go vertical. The result of the chunk combination and the generated content in each of them will guarantee that no playthrough is like the other. Today we have the scheduled Mid-Campaign Live Show with our special guests, Mark Meer and Specki T.D. . The event will start at 9 PM Central European Time and will likely run for a while, considering we do expect a few people to have a few questions to those two. We will also talk about the future of the campaign, the game and other things you may want to know about. Feel free to ask us anything! We will have another update concerning the Ravensdale Setting Soon(TM)! And we are working hard to bring a few more surprises to the table. So stay tuned for that! Enjoy the update and as always, spread the word, comment, discuss! P.S. : The last update had a visit from the Typo-Devil. Our Creative DirectORK was misspelled "Heassig". The correct spelling, of course, is "Haessig"! 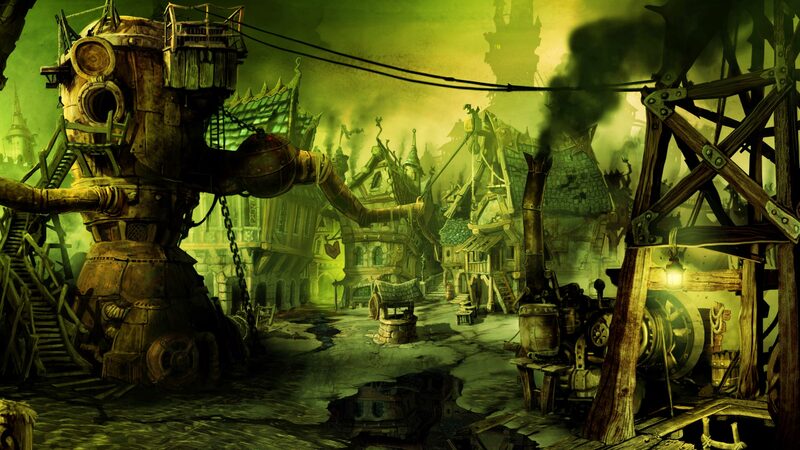 Ravensdale is a sprawling medieval oil rig city populated by a plethora of crazy fantasy creatures (including humans). It is a chaotic mess of a city, oily, gritty and stinking. The oil is named Goop and is used for EVERYTHING possibly imaginable. Everyone in Ravensdale sees it as an opportunity to become rich and famous … regardless of consequences. While Goop is a noxious substance that corrupts mind and body, nobody wants to face that reality. The only thing that counts for the inhabitants of Ravensdale is making as much profit as possible to stay on top in a dog-eat-dog society. The number of people aware of the dangers Goop poses is dwindling; it has already mutated most of the populace into crazy orcs, goblins, witches and other creatures. Over the top, humorous, ironic, acerbic. It’s a satire of our contemporary age, where Goop replaces cell phones, genetically manipulated food, wine with sulfides, tobacco, etc. to caricature the madness of mankind. The creatures of Ravensdale are like in zombie movies, but not quite as brainless: they are more like consumeristic addicts, slaves of Goop, reckless, excessive, brutal, and completely under the thrall of their base desires. 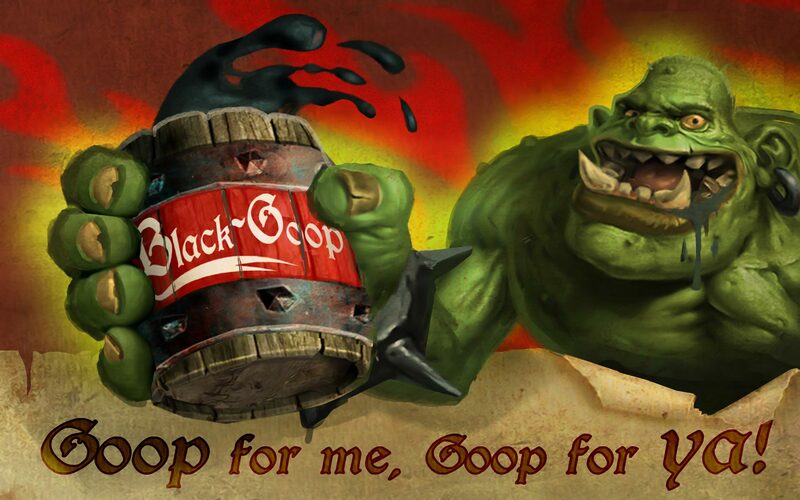 For some, Goop is the blood of a dragon god. Others treat it as a mundane commodity like soda or beer. Scholars and magicians study and manipulate it, with unpredictable results. The effects of Goop are outrageous, ironic and amusing, but don’t stray into the territory of the disturbing or truly bizarre. The setting of Ravensdale doesn’t take itself seriously and doesn’t strive for the depth of a 1984. It’s just there to poke fun at western society. As a small reminder, our mid-campaign live-show is scheduled for Thursday August the 1st, at 21:00 CET. We will have Mark Meer joining us as well as Specki T.D. , both of them ready to answer questions or just chat with us and you! Be sure to join us and spread the word! Also, stay tuned for our next update (we promised you more updates after all!) which will shine some light on gameplay aspects of Ravensdale!